I hope you all had a marvellous Christmas and an enjoyable New Year period! That’s better! The remnants (weed piles) of the late autumn and early winter storms are still piled up on some of my local beaches – but at least the sea is safe and fishable now! After returning from my ‘festive duties’ and following a quick check to ascertain the general sea conditions I embarked on a very short session on New Year’s Eve (during the day) with a friend of mine (John) to a mark that has been very consistent since November. On a beautifully tranquil morning, and with the celebrations later in the day on my mind, I was very happy to see a splash and feel the rod pull down to a modest bass that had grabbed a lure that is likely to catch a tremendous amount of bass in 2019 for many anglers – the Whiplash Factory Spittin Wire here. My last bass of what was a memorable 2018 season taken on a surface lure on the last day of the year – a pleasing way to finish. Into 2019 and with a slight 2-3ft swell now gently pushing some wonderfully aerated (but still clear) water around the coastline I decided to hit some rough ground marks. Boy did it look tasty and I was expecting a leviathan to emerge from the depths at any second as the tide flooded into an area where I have caught many 5lb+ bass over the years – but it didn’t happen on this occasion. I actually expected to catch during this session even though it was the first week of January. What fantastically invigorating conditions to be outside and purging yourself of the Xmas excesses though! A second session with another friend of mine (Steve) also failed to produce – although he did have two small bass follow his lure and I managed to have a play with his Christmas present – his rather nice new lure rod (the Tailwalk EGinn 86L-R Max 24g here). It was all good for the soul, and I did feel like my ‘detox’ had begun, as I’m giving up red wine, bread, cheese and pasties until the end of March at least! At this time of year bass catches are (generally speaking) extremely localised, and they are often found wherever the herring and/or sprat shoals are located. There are two problems with this though: firstly, unless they are clearly visible (gulls crash diving into them) it is virtually impossible to know where they are, and secondly, this is often out of casting range anyway. Although a diver friend of mine has subsequently confirmed this activity (with reports of good numbers/shoals of bass positioned in ‘pockets’ and primarily over a sandy seabed) I deduced from my recent blanks to change my approach somewhat, and to fish in darkness, whilst returning to some of my recent estuary haunts. With the air pressure high, the tide ‘just right’ and the water as flat and as clear as it gets I really fancied the next session would produce. “All the ingredients are in place” I told Steve (my companion again) as we trudged through the woods as the frost formed – not surprising given the minus one air temperature! As we arrived, it was calm enough to see the reflection of the stars on the sea’s surface – an astonishing and atypical event. When the conditions are this serene I tend to commence a night session with one of the least obtrusive (not rattling or wriggling) lures in my box, therefore, I attached a white 6″ 18g senko (the Insane Creations Bass Slayer here) that a 62cm bass here had snaffled back in November from a very similar mark. A relatively chunky lure, I like the way you can still ‘feel it’ even when there is quite a strong tide running – which there was here initially. 10 minutes in and I felt a ‘bump’ but put it down to maybe a flounder having a speculative grab at the lure as I lifted it off the seabed… A few casts later though and there was a definite and unmistakable bass ‘hit’ that reverberated through the rod – they were here! Although my nose and fingers were already tingling from the very cold air I was now startlingly alert to the next event as I searched out the underwater terrain before me. BANG! (Bugger!) how on earth did I miss that!! Could the lure be too big for what I suspected were small bass? A small one was better than nothing I thought, so I decided to change to a smaller (but still white) senko in the form of the devastatingly effective (at times) Wave Worm 5″ Tiki Bamboo Stick here. I would cast out, let the lure hit the bottom (6-7 seconds) and then commence with a steady retrieve at approximately one turn of the handle per second. Following a quick swig of tea from my flask (it goes down a treat!) for the next ten minutes I continued with an approach that has served my clients and I well, when, halfway in, the lure just stopped as a sharp jolt was sent through the rod before it arched downwards and the fish just took off! A real stop and then a strong pull are often an indicator that a better one has nailed the lure… Yessssssssss!!!!! A good 4-5m of line was dragged off the spool, before the bass splashed on the surface a good 25m out I’d say (hard to tell when it is so calm). It then decided to head down-tide and in an arc towards the shoreline, whilst thumping and shaking it’s head – it felt good to be attached to something like this again I can tell you! The next time the bass surfaced it was only 10m out from my stance, whereby I did my utmost to keep it there due to the zone of bladderwrack to my right – which, of course, it then decided to head for! Shouting to Steve and fumbling to switch on the headtorch to ‘main-beam’ when the light did appear, in conjunction with my breath (panting) in the cold air, I was really struggling to see where the fish was (and its size) through the condensation – all I knew was that I didn’t want to lose it! Measuring 60cm (over 5lb in weight) this one had me quivering with joy! With the rod held out to left and as high I as I could possibly get it, the bass surfaced and ‘lolloped’ for want of a kinder phrase as if to say ‘OK, I give up’ before allowing me to slide her onto the gravel. It had been a great scrap, and as she lay calm (for the moment) I could feel my hands shaking with excitement – these moments still mean an awful lot to me! I took the photographs above and as Steve arrived I crouched down to unhook this beauty – which was when she decided to wake up again! Gills flared, flipping around and those vicious spikes erect, I had to be ultra careful not to get a nasty injury – she was not happy! A very satisfying way to start 2019! Following on from last month (when I landed my biggest ever bass during December here) this equals my best in the January. Having landed another much smaller bass on the first session (after returning my 60cm fish) over the next two nights I, of course, decided to head out looking for more – the obvious difference being that although the nights were still ridiculously calm for the time of year, they were also a good 7-8ºC warmer due to the increased cloud cover. The first of three on the second night from the same mark – this one took the lure within two seconds of it hitting the surface as it descended though the (roughly) 5ft of water. I managed three bass on the second evening from the same mark, again all on the Wave Worm and that were landed within a short (30 minute) window in the tide. The first one took the lure ‘on the drop’ as it were, where as the second hit very close to me (3m out). 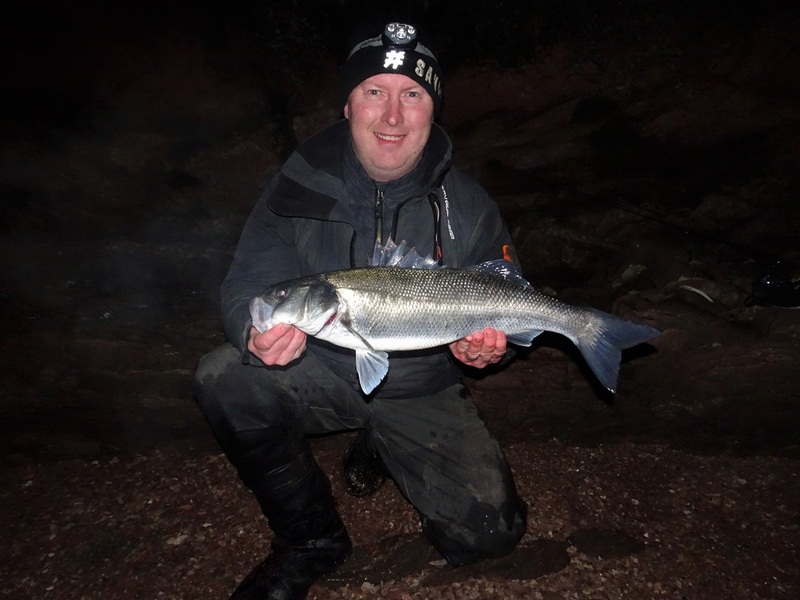 The largest, which was around 2½lb actually grabbed the lure three times before eventually hooking itself, again fairly close to my stance – clearly, within that period quite a few bass must have moved through on the tide. Could the warmer air have encouraged the smaller ones to feed avidly? Looking back through my notes there is a correlation between colder nights and the larger ones turning up – maybe they have the bulk to withstand the lower temperatures perhaps? Although it isn’t entirely unusual to still be catching bass in January on lures here in south Devon, after what I consider to be late start to the 2018 season (due to the cold sea temps) and the late Autumn gales (that tore up the open coastline) it is a very welcome end (or start in some ways) to what is my/our season – as it can be notoriously difficult to find them in February! My inaugural 3 Day Packages (3 Clients, 3 Days of guided bass fishing and 3 Nights Accommodation at the Chillington House BB Hotel for £499 per person that I completed in 2018 were a success (see the testimonies here) on may levels – not least, because of the bass that were caught, but the camaraderie created and the learning that took place. Furthermore, having ‘sold out’ of my self-published book The Lure of The Bass just after Christmas I have recently taken delivery of the next batch. Therefore, if you would like to purchase a copy (they are currently only available directly from me whilst I investigate other potential avenues including an eBook) then please complete the form above – the price is £18.98 (this includes postage and packaging). Next 3 Day Packages – 2019 Dates Released! Really enjoyed the book and cant wait to now put it in to practice – have recommended it to one of my fishing buddies ! Still getting out when the weather permits it( and the house search), but cant wait for Spring to arrive – and hopefully more bass! So glad you’re enjoying the book. Great report Marc. Looking forward to meeting up with you again. Love the book. Glad you’re enjoying it! Really looking forward to guiding you again mate. Yes, it’s very satisfying being able to successfully target them in winter – you have to work extra hard mind! Well done Mr.C looks like your having a cracking time with them Devoni girls. I hope we have a good Spring this year and the fish don’t leave it as late to show as what happenend last year! Fingers crossed hey.. They take a bit of finding this time of year but we’ll worth it!